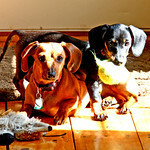 Doxie Archives on Hillbilly Hill Farm: The lengths my hubby will go to, to keep me laughing! The lengths my hubby will go to, to keep me laughing! Yesterday, I was at my computer when I heard my hubby come in the back door, and go over to the kitchen sink...and say "I could use some help up here!" I get up, and ask what's wrong as I go up the stairs...no answer. Wondering how bad he is bleeding, I reach the top of the steps, and see him bent over the sink. No blood showing...so I head over to him and he kinda turns a little so I can see his face and it's all black and is his hands and arms. He turns back and starts scrubbing again. I kinda chuckle and asked "What happened!" thinking it looked like he was covered in soot, but didn't know HOW he could have managed THAT! He said "A paint can exploded" and he continued to try and scrub it off him. It was a loosing battle...so I chuckled again and said you need to go down and jump in the shower. So he picked up his glasses, looked at them, then put them back down and headed down stairs. So....here he is, his face, hands and arms covered...I have some on my hands I can't get off, from his glasses and we are wondering what the heck to do...neither of us can touch anything much because we didn't want paint all over the place...and I'm still having giggle fits, every time I look at him. So...I gingerly grab the phone and call Mom, and ask if she can google how to get paint off...since I didn't want to get paint all over my computer. Naturally in the middle of the phone conversation Galen reminds me I COULD put gloves on. DUH! ROFL So...I get some medical gloves out of the cabinet, and put them on, so least I can again touch things. We decide to try paint thinner...which we didn't have as Galen doesn't use it, so I meet Dad part way to his house to get some he had...and Galen is going out to at least try getting some of the paint off with Gas while I'm gone. When I got back, we went to work getting the paint off his skin, with the paint thinner...and it got some out of his hair, but it still wasn't coming out of that very good. Galen was just SURE he was going to have to shave his beard and head...but I kept saying NO...it's working, we just have to keep trying. Galen jumped back into the shower, to get the paint thinner off, and used laundry soap as soap since it's harsher. I called Mom and said it worked on his skin, and she said she read to try mayonnaise to get it out of the hair, so I went up and got some and we sat with that soaking for a little bit, then he used more laundry soap, cause it was working somewhat before...and he managed to get the rest of it out of his hair. No shaving required! As he was drying off, hubby quipped "Real men don't use hair dye....they use paint!" ROFL That's my silly goofball!! I chuckled about this ALL DAY yesterday! It was just to funny...had me worried a time or two, cause I know paint isn't good to have on your skin...and I was so thankful that his glasses stopped it from getting in his eyes, as that would have been disastrous...but God was good and helped us get it off...and I have to say, I do LOVE laughing, so it was good to have that chuckle not to far away all day.